Okay, so I just got Star Wars: The Force Unleashed 2, I'm pretty psyched about this game because I enjoyed the prequel a lot, come on, who wouldn't appreciate the abusive use of The Force?, Plus when I saw the cinematic trailer of the sequel, which was pretty epic, I was sold. (Thank you YouTube and E3 for this: http://www.youtube.com/watch?v=94-4c0eJikk). And let's face it, I grew up to the Star Wars movies, during the age of the Laser Disc, so this was pretty much a done deal. *Don't worry, I hate spoilers so there aren't any story giveaways here. The beginning of the game treats you to the traditional Star Wars music as well as the "scrolling into the stars" story presentation. I wasn't expecting much but when the opening cut scene loaded, I nearly dropped my controller in awe, the graphics are beautiful, I mean, really amazing, one of the best ones I have seen in a long time, I can't stress enough how beautiful the cut scenes are, coupled with the always epic musical score to go with it, I was blown away. So as the game starts, they give you a brief "tour" of the controls which are pretty much the same as the first one except now, you have 2 Lightsabers, I repeat, 2 Lightsabers! If you recall all the destruction you dealt with one Lightsaber, imagine the diversity that 2 gives you, you are now equipped with a few more combos and an expanded move set. Aside from the graphically pleasing environment, a nice little touch has been added to the battle gameplay: DISMEMBERMENT. For those fans of video game violence (like myself), this is awesome, you can literally chop off limbs of Storm Troopers, behead via Saber Throw, just like how it should happen based on the movies (e.g .Luke's hand getting chopped off). 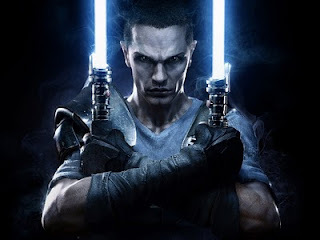 Another neat little weapon added to Galen Marek aka Starkiller's arsenal is the move called "Mind Trick", it's pretty entertaining to use because you get to turn enemies against each other, you can even get some to commit suicide by either jumping off a platform or into a laser force field. At times though, the targeting system goes haywire and doesn't really lock on to what you want to lock on to but then you rarely need it unless you're against a large enemy or you want to torture the heck out of an infantry member by holding him in your Force Grip and continuously throwing your Lightsabers at him or electrocuting him over and over again (which is kinda fun, I have to admit.). The way to kill the larger enemies hasn't changed from the first one wherein you must inflict enough damage before being able to perform a button sequence finisher that pretty much does the same thing for the same types of enemies. The skill upgrade system has been simplified a bit, not that it was complicated to begin with, the process is pretty much the same as the first Force Unleashed. Overall, the game is pretty good if you're a fan of beat em' up games on graphical steroids and you don't mind repetitiveness and lack of a deep storyline then this is a game for you. Overall: I'd give it an 7.5/10, I'm really into a game with a good storyline, the graphics would have been a perfect complement to the storyline if there had been more depth into the plot, also a highly expanded move set would have been great, don't get me wrong, I'm happy with the new additions, but it feels too close to the first game that I hardly notice the add-ons. I'm quite disappointed that the story wasn't as epic as I expected it would be, just like any game, this has it's pros and cons, but I enjoy it so I don't regret purchasing it.